I decided to use a different colour for the heel and toes as I died only 50grams of sock yarn and that's like 20 grams to little for socks for my feet (yeah, I don't need 100 grams). I really like how this yarn turned out. I can hardly believe it was my first time dyeing yarn and I did stripes! I hope now I'll have enough for the second sock. 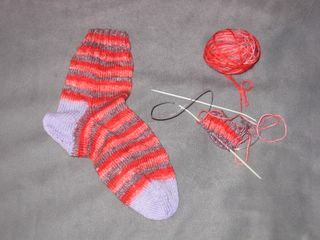 Luckily I don't mind knitting the second sock, I even find them easier then the first. Somehow it feels like it goes quicker. On a sidenote, when I learned how to knit I started knitting with my left hand. Now I know that's continental knitting, but till about 3 months ago I was under the impression I did it totally wrong. Over here only the English method is learned, as far as I know I have never seen someone knitting the continental way. So I was surprised to learn my way wasn't "bad" and I always managed to knit quicker then people around me, so now I know why (continental is said to be quicker ...). Anyway, with this sock I'm trying to purl continental as well as I think it'll go faster, but I'm not good at it yet so I'm considering this my "try-out-sock"! WOW - you dyed that with KoolAide? Love it!! Can't find an email address for you so thought I would post a reply here. Thanks for comments on my blog (Sockladyspins) about the white socks. They were knit from my own handspun with patterns I just kind of unvented as I went along. Nothing was ever written down and I am sorry now that I didn't. How'd you get it to stripe like that?